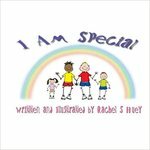 "I Am Special" shows your child how special they are to have two dads. Huey, Rachel S., "I Am Special: I Have Two Dads" (2012). DIVerse Families. 264.